This is the first in what we hope becomes a series of blogs discussing corporate wellness. We hope you enjoy and join in on the conversation. “Worksite wellness”, “well-being”, “culture of health”….these are all trending tag lines that represent an overall focus on a major concern affecting more than the average employees, it is also having an impact on today’s workplace. Regardless of what you refer to it as, there is a big push for employee health and wellness in the workplace and it is being realized through the implementation of corporate wellness programs. These programs typically incorporate a specifically designed health promotion initiative with activities that encourage and support employee’s healthy behaviors, increase health awareness, and improve overall health results. The obvious advantage to the employee of a corporate wellness program is improved health. But that’s not all….these actively participating employees also have the opportunity to improve their overall well-being while becoming more engaged in company programs, which in turn, can increase happiness in the organization due to these extra benefits. Improved health can also boost productivity because the working hours become more fruitful and less sick time is taken. As employees become more knowledgeable about wellness and begin to implement more healthy behaviors they’re able to share with others and become influencers in the workplace, in their own homes, and in their communities. By spreading this culture of health employees can also begin to feel accountable and support each other in these efforts. Overall this can increase positive morale to help employees better enjoy their time in the workplace. When you think of the gain for employers of a corporate wellness program you typically think of reduced costs. Yes, this is a major focus and over time a major goal, it definitely makes sense as an investment strategy for employers. However, there are intangible benefits to a corporate wellness program also. Obvious cost reductions due to a healthier employee population would be through health benefits, workers compensation, and short or long term disability claims. If your employees are healthier they’re less likely to become sick or injured in the workplace and therefore reduce those costs. In addition, this also increases presenteeism and therefore allows for more productivity because employees are available and working. Corporate wellness also provides company recognition and leadership within the community. Currently (and growing) there are various corporate wellness awards and opportunities for company promotion to take advantage of, and organizations going this direction are recognized as employee advocates and supporters in helping tackle major health issues. And last but not least, wellness programs can also become a recruiting tool as an additional benefit to potential new hires. Bonus! Jump on the Bandwagon…or Else! 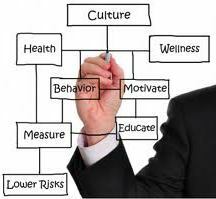 It’s important that we take a step in the right direction to promote and support this developing “culture of health”. Corporate wellness provides benefits to both employers and employees; it’s a win-win. Organizations benefit from reduced costs and increased productivity, while employees become healthier with increased engagement and value. Everyone has the opportunity to benefit from this exciting wellness venture, so get on board!